Posted by Pam in KC in OTR, retreat. 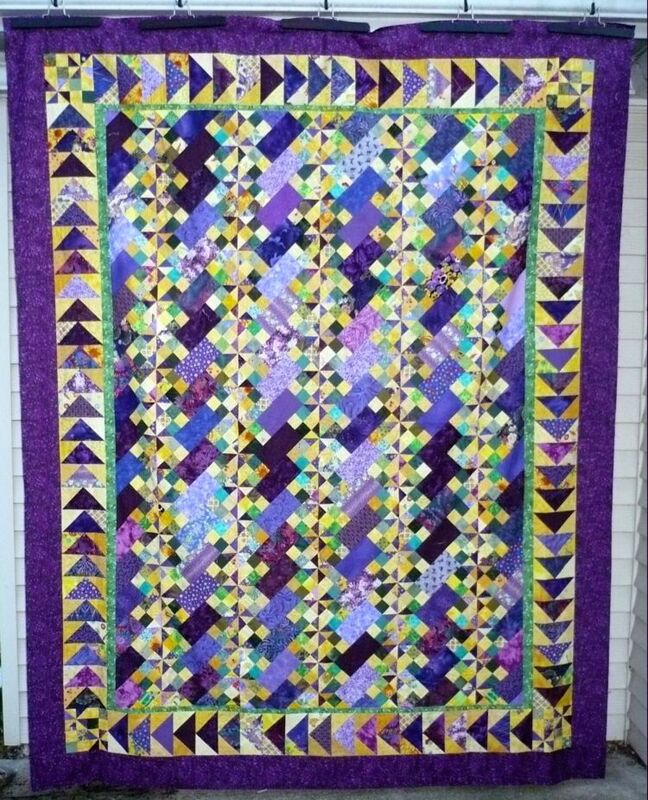 Posted by Pam in KC in music quilt, OTR, Stash Busting Report, vintage fabric. 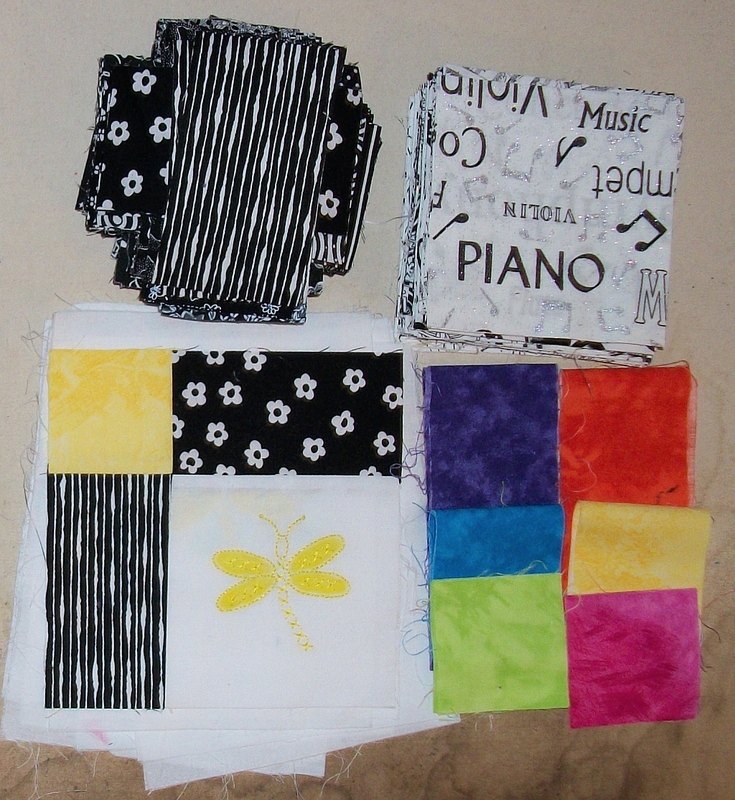 No dent in my stash this week, although I did get my geese sewn together and one more row sewn together on the music quilt. On the other hand, I did bring fabric into the house. Last Sunday, when Sandra, the list mom from Stashbusters, was in town, we got together for a visit. 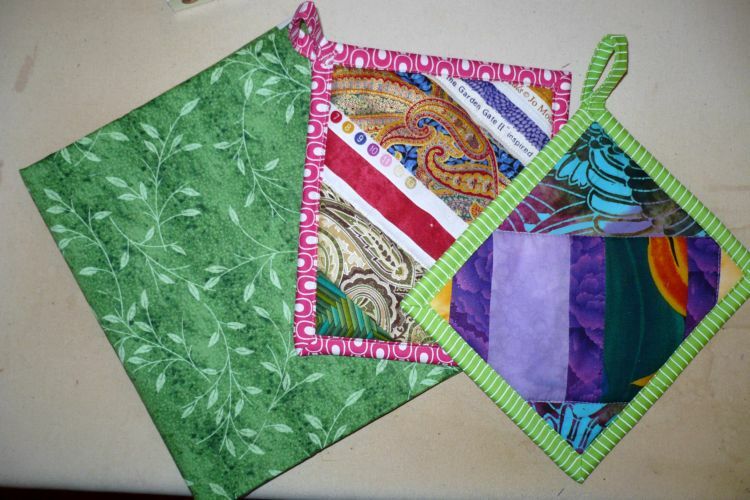 She gave me a couple of potholders she made (and I’ve enjoyed using this week) and a yard of pretty green fabric. Friday morning I picked up the yardage for the borders to OTR. Saturday another 1 1/2 yards for a bag I’m making for a gift. But it was Saturday afternoon which really caused my stash to grow. A friend of a friend had fabric from her mother’s or grandmother’s estate. The boxes contained a little of everything, about 1/2 of it cotton. 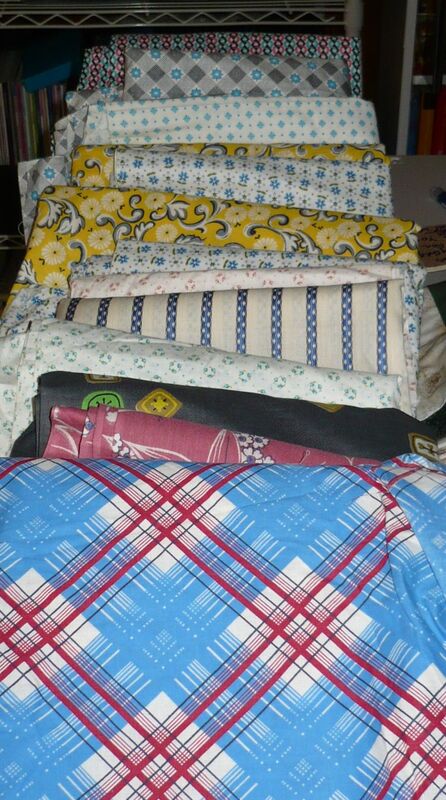 Of the cotton I brought home 13 pieces. I just finished measuring it. There’s 48 1/4 yards there — but it’s all 36″ wide. I did some fancy math to figure out what the works out to in 42″ wide fabric on the theory that if a pattern today calls for 1 yard of fabric, 1 yard of this vintage fabric won’t be enough — I’ll need about 42″. Posted by Pam in KC in haiku, OTR, Seven. Cats and quilting go together at my house. I’ve owned, or been owned by three cats since I started quilting. Fluffy and Grey were the original QCCs. 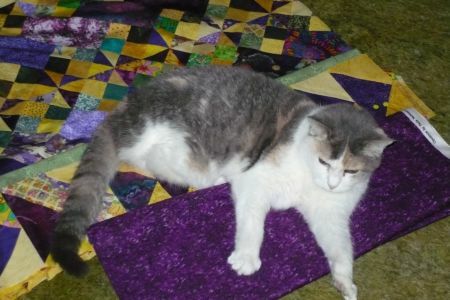 Seven wasn’t interested in quilting — or for that matter living with two other cats. But after Fluffy and Grey crossed the rainbow bridge, Seven realized she had to fulfill the role of QCC. I don’t know what it is about cats and quilts. 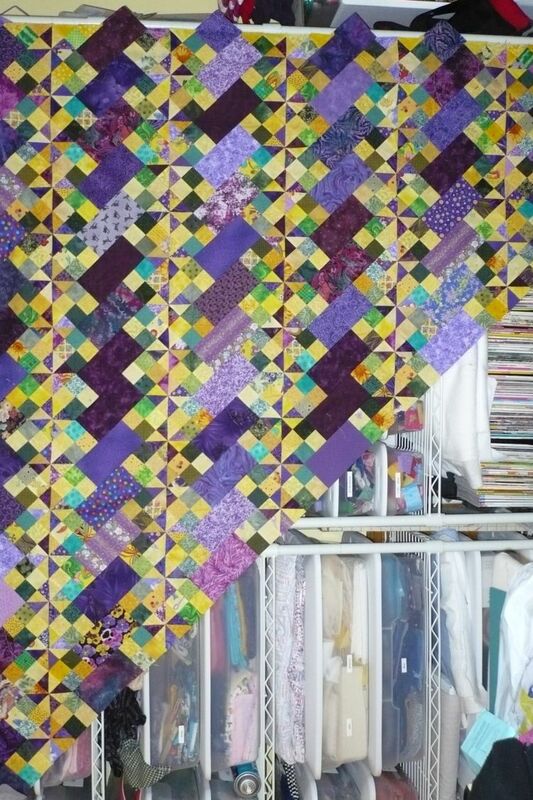 One time I brought several quilt tops into the living room to show my mom. Seven was sound asleep in the bedroom. I’m not certain all the air got out from under the quilt top when I shook it out and laid it out on the floor, before she was there laying on top of it. Another time I had a top on the floor, blocking access to the kitchen and sewing room. Seven walks in and comes to a screeching halt, stopping BEFORE she touched the quilt top. I have to assume she didn’t like it. My DH picked her up and told her she had hurt my feelings, so when she came back through the room, she gingerly stepped on the top and briefly sat on it before walking off. Somehow. Tonight when I came home, Seven was sitting on the couch with DH. I pull out my Old Tobacco Road quilt and lay it on the floor. Seven doesn’t move. 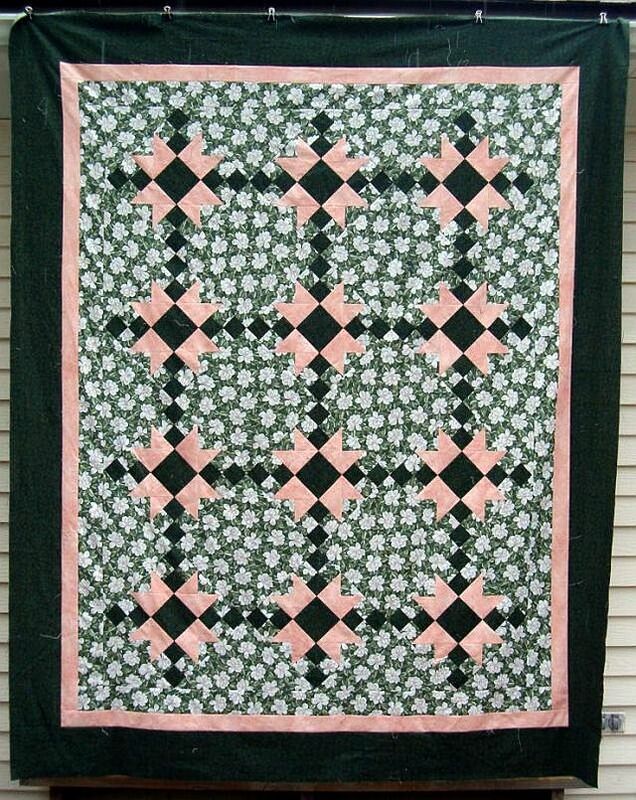 I pull out the inner green border I just bought, and lay it next to the quilt. Seven remains on the couch. The flying geese are stretched out next to the green border. No response from Seven. 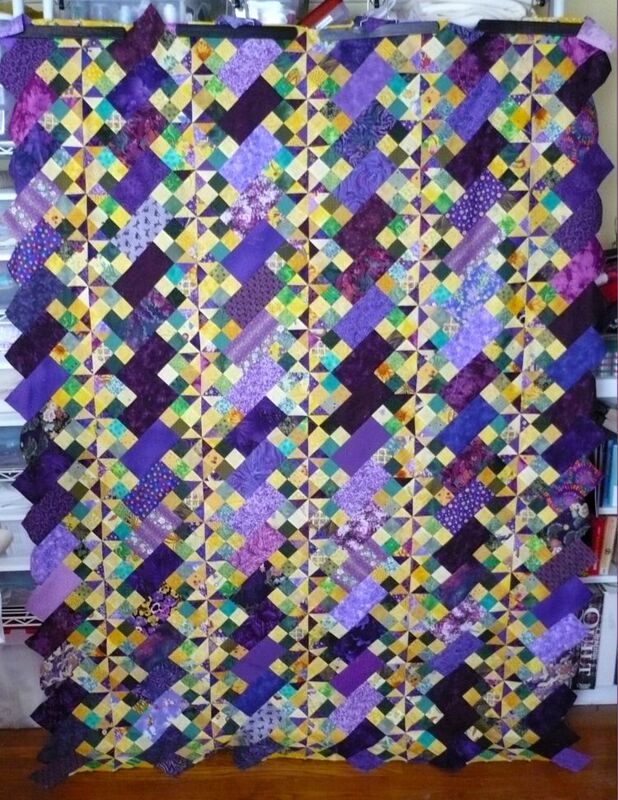 Finally, I lay the purple outer border next to it all. Seven leaps off the couch and jumps on the quilt and fabric and starts ‘massaging’ the purple fabric, before reclining on the quilt. I have to assume she likes it. Posted by Pam in KC in OTR. The center of OTR is done. I think it’s growing on me. Now I’ve got to locate the instructions for the next step, and the rulers to make the flying geese. I’m not certain if they will be yellow geese on purple skies or purple geese on yellow skies. 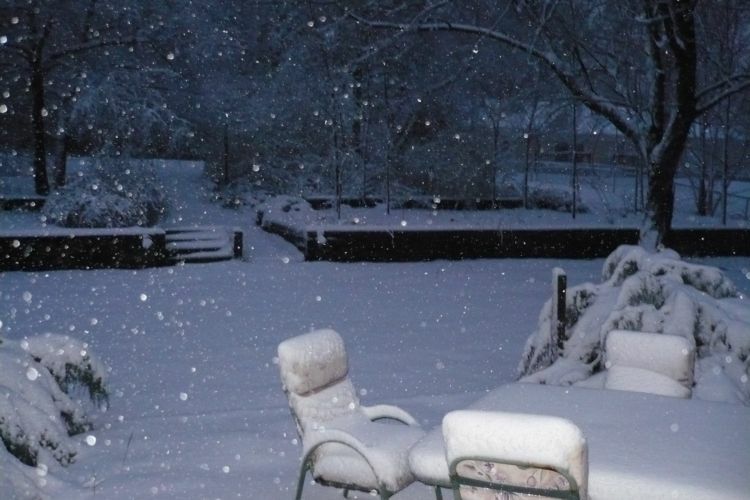 Posted by Pam in KC in OTR, snow. 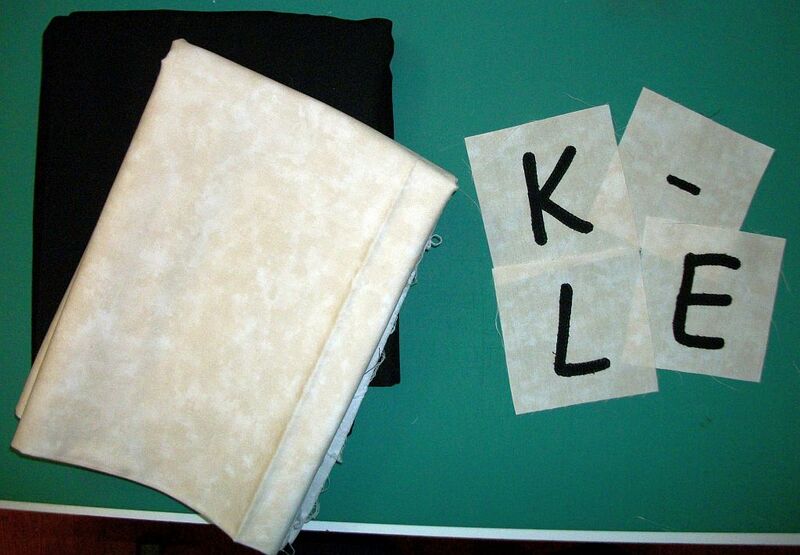 I’ve continued work on my OTR and now have the rest of the blocks sewn together into rows. I thought I’d take a break and check on the snow. It’s been snowing for about 6 hours. So far we’ve accumulated 5 1/2″ — at least in my backyard. I just heard a weather update that said the snow is supposed to be tapering off. 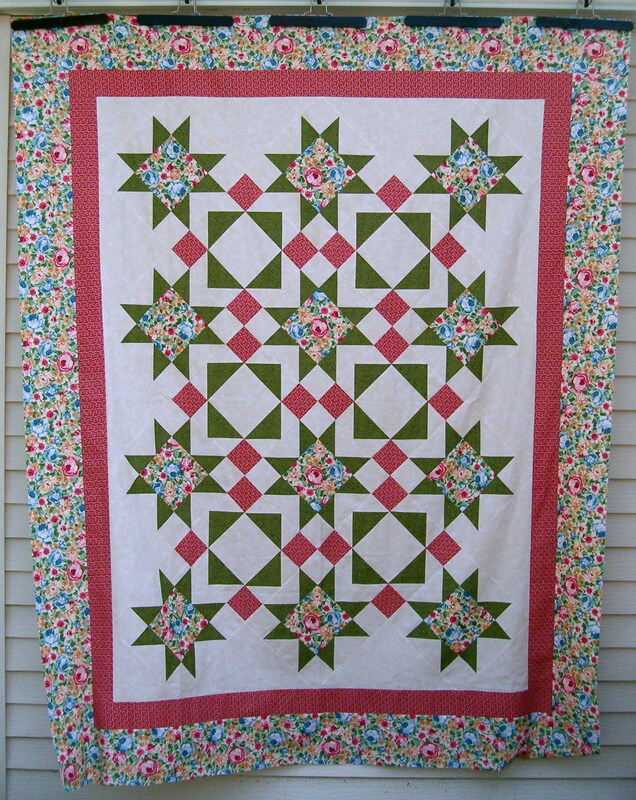 For the last couple of days I’ve been working on my Old Tobacco Road quilt, a Bonnie Hunter mystery from last fall. I now have the center half finished and decided to stand back and see how it looks. I’ve been working on my OTR the last couple of days and now I have part #3 done. Step #4 is the layout. 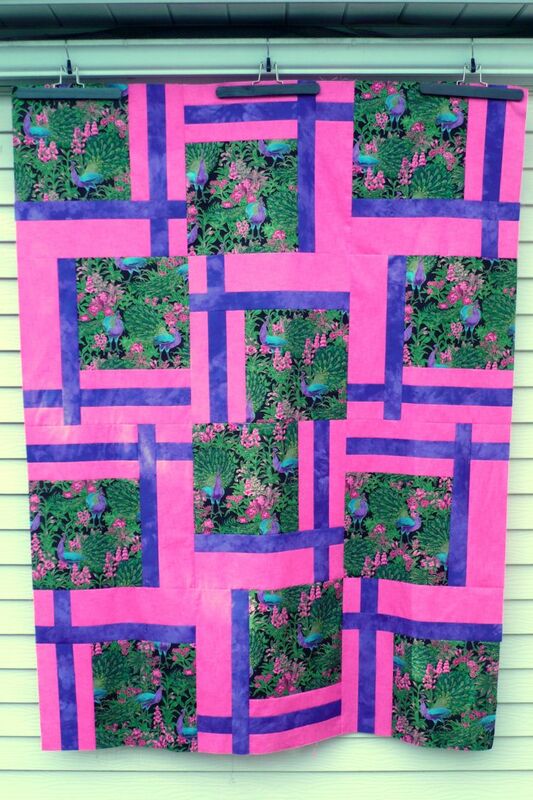 I need to do some quilting, so I think this will go back into the box and I’ll take it with me to the reteat to work on next month. Posted by Pam in KC in OTR, Pink and Brown, Stash Busting Report. This week more fabric came in than went out. Monday was the Kansas Trouble Stash Society meeting with a whopping 10.75 yards. Tuesday a package arrived from Tammy with red and greens in exchange for the music fabric I sent her a couple of weeks ago. Since I counted the music fabric Out, I’m counting this fabric In. Then Wednesday I added another 2 yards for borders and binding for my Pink & Brown quilt — which still needs borders. I haven’t made it to the basement with the fabric to wash. In the use department, I finished setting the blocks together for the Pink & Brown quilt, finished ALL of step 1 on OTR and finished making the pinwheels and half-pinwheels from step 2. Most of this is not countable as it had all been chopped up prior to the first of the year. 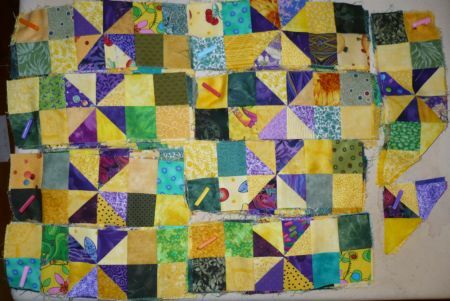 I did have to cut a few more strips for the pinwheels. What is countable is the 2 Broken Dishes blocks I’ve made to take to the retreat in April and the String blocks I made yesterday to send to Australia. I seem to be going backwards. Got to do something about that.